For modem users, the files below will take several minutes to download. 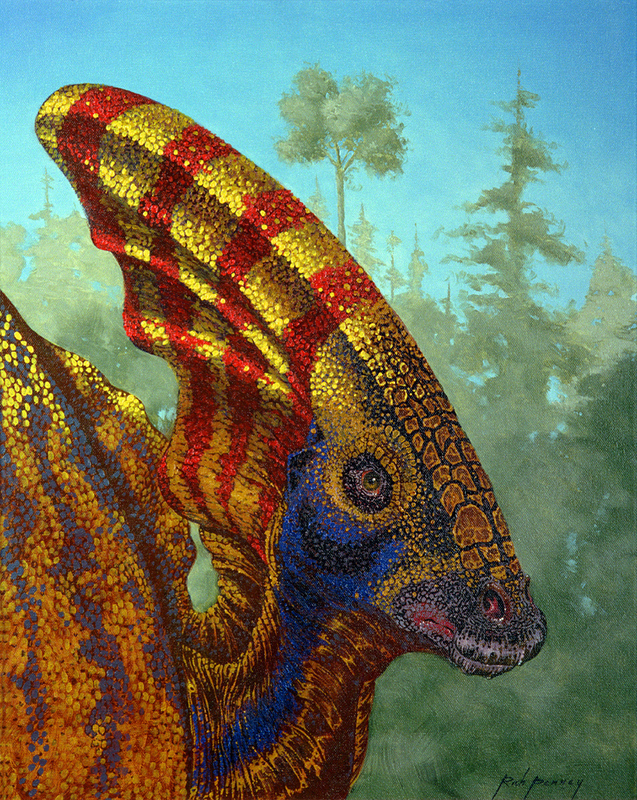 Parasaurolophus dinosaur, by Rich Penney, paleo-artist, Santa Fe, NM. Scientists at Sandia National Laboratories and the New Mexico Museum of Natural History and Science have collaborated to recreate the sound a dinosaur made 75 million years ago. The low-frequency sound was produced by computer scientists and paleontologists using computed tomography (CT scans) and powerful computers. Sandia is a Department of Energy multiprogram science and engineering laboratory whose primary mission is to ensure the nuclear weapon stockpile is safe, secure, and reliable. The study of dinosaur vocalization began after the discovery in August 1995 of a rare Parasaurolophus skull fossil measuring about 4.5 feet long. The dinosaur had a bony tubular crest that extended back from the top of its head. Many scientists have believed the crest, containing a labyrinth of air cavities and shaped something like a trombone, might have been used to produce distinctive sounds. As expected, based on the structure of the crest, the dinosaur apparently emitted a resonating low-frequency rumbling sound that can change in pitch. Each Parasaurolophus probably had a voice that was distinctive enough to not only distinguish it from other dinosaurs, but from other Parasaurolophuses. The sound is an approximation of the possible tones that the dinosaur crest was capable of producing. Paleontologist Tom Williamson and computer scientist Carl Diegert had to use common sense and some imagination to reconstruct not only missing parts such as the beak and nostrils of the dinosaur, but also the soft tissues of the head and throat that were not fossilized. Since it's uncertain whether the Parasaurolophus had vocal cords, a variation of sounds with and without vocal cords was simulated. "The sound may have been somewhat birdlike, and it's probably not unreasonable to think they did songs of some sort to call one another," Diegert said. "Fossil records of the large bones in the dinosaur's ears compared to corresponding bones in human ears suggests they were able to hear lower frequencies than humans." Williamson, curator of paleontology for the New Mexico Museum of Natural History and Science in Albuquerque, speculates the dinosaur's ability to make distinctive sounds probably enhanced its tendency to socialize with other Parasaurolophuses. The computer-modeling techniques used to create the dinosaur sound are the same ones Sandia uses to create complex, three-dimensional models for conducting computer simulations of problems that cannot be subjected to real-world tests. 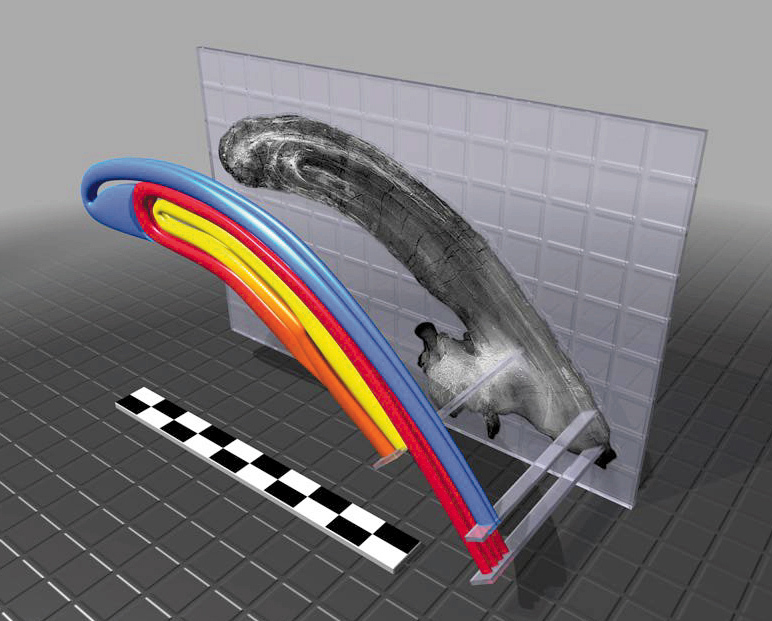 Sandia uses X-ray tomography similar to the CT scans taken on the dinosaur to develop advanced-imaging techniques for manufacturing design and testing. The dinosaur imaging allowed Sandia scientists to expand their own computing skills in developing and applying those complicated codes. The basic-science work is funded by the Department of Energy Office of Computer Technology and Research under the auspices of the Mathematics, Information, and Computer Science (MICS) program. "The most important thing about Carl's work is that it opens an entirely new field for the application of computing, which is critical to our mission and to real-world engineering in general," said George Davidson, manager of Sandia's Computer Architectures Department. Davidson said the same 3D imaging techniques can be used to analyze and predict the structural integrity of mounting brackets on aging airplanes, the internal structures of aging weapons, and the accurate reconstruction of the forces and mechanical failures associated with the crash of an airplane carrying nuclear weapons. "The general capability that Carl's research is developing offers an early look at a new engineering use of computers, which will one day be a broadly applied engineering tool," Davidson said. An added benefit of the project, Diegert noted, is the widespread visibility it gives to high-performance computing and its growing importance as an engineering tool. "So much of our work at Sandia is classified and we therefore can't talk about it." Diegert said. "This is a project that's appealing and we can talk about it, and therefore, it can serve as a recruiting tool for getting more young people interested in thinking about a career in computing." Parasaurolophus, one of the dinosaurs that appeared in the films Jurassic Park and The Lost World, lived during the Late Cretaceous Period, about 75 million years ago. The crest of the Parasaurolophus was unearthed near Farmington in northwest New Mexico on public land administered by the Bureau of Land Management. The well-preserved skull includes a nearly complete crest, lacking only the segment below the eyes, making it the second-most complete skull of a Parasaurolophus known. A three-dimensional computer model of the crest was created by first performing a CT scan of it at St. Joseph Medical Center in Albuquerque. A series of about 350 cross sections were taken of the skull and crest at 3mm intervals. The results showed a much more complicated internal structure than had been known previously. "Not only are there more tubes than the simple, trombone-like loops described in previous studies, but there are new chambers within the crest," Williamson said. 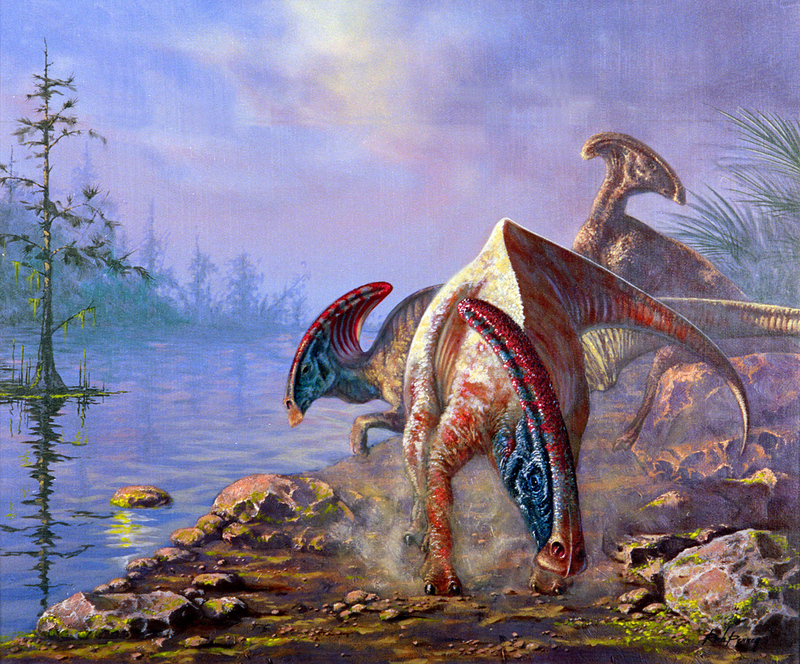 Family of Parasaurolophus dinosaurs, by Rich Penney, paleo-artist, Santa Fe, NM. The use of digital paleontology, Williamson said, permitted a thorough analysis of the inside of the crest without having to physically cut through it, and thereby damaging it. The cross sections were loaded in numerical form into a computer in order to reconstruct an undistorted crest. Diegert and Williamson studied the images and instructed the computer how to read the density in order to sort out which was bone and which was the sandstone and clay that fills and encases the fossil. Once the size and shape of the air passages were determined with the aid of powerful computers and unique software, it was possible to determine the natural frequency of the sound waves the dinosaur pumped out, much the same as the size and shape of a musical instrument governs its pitch and tone. 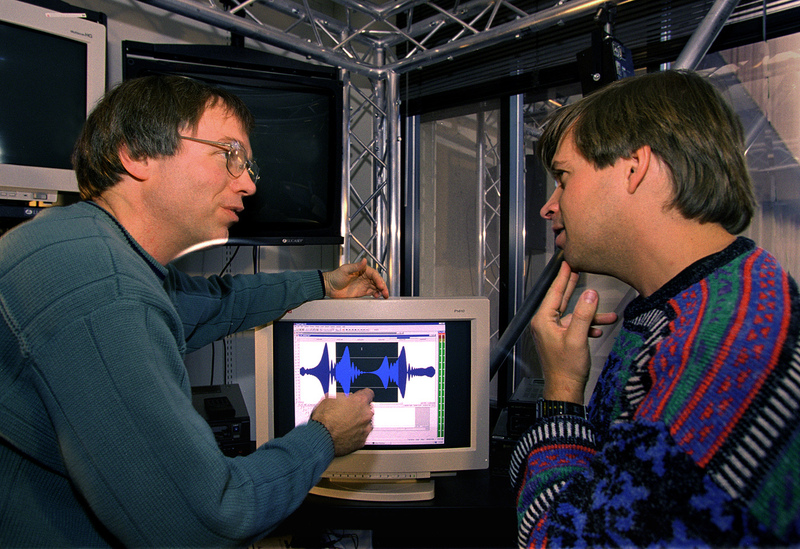 High-performance computers were used to do the initial image processing, analysis and actual sound creation, including a Compaq Computer professional workstation, an Intergraph Corporation TDZ workstation, and a Silicon Graphics infinite reality workstation. "A very complex shape such as the dinosaur crest takes lots and lots of numbers to describe the shape in the computer," Diegert said. "It's only recently computers have become powerful enough to allow that to happen." Once the 3D model was completed, the computer was able to simulate blowing air through it to amplify the tones it was capable of making. Sandia National Laboratories is operated by a subsidiary of Lockheed Martin Corporation for the Department of Energy. With main facilities in Albuquerque, N.M., and Livermore, Calif., Sandia has broad-based research and development programs contributing to national defense, energy and environmental technologies, and economic competitiveness.